This week, Alan Meale and Giuseppe Galati, co-rapporteurs on Armenia of the Parliamentary Assembly of the Council of Europe (PACE) Monitoring Committee, during their visit to the country, met the President, Prime Minister and a number of senior officials to discuss Armenia’s democratic and legislative development processes, as well as issues linked with the April four-day war in Nagorno Karabakh. Referring to the fact that this year is the 15th anniversary of Armenia’s joining the Council of Europe, President Serzh Sargsyan said with satisfaction that as Armenia, the Council of Europe also appreciates the progress made in Armenia during recent years in the areas of human rights, democracy, and the rule of law. 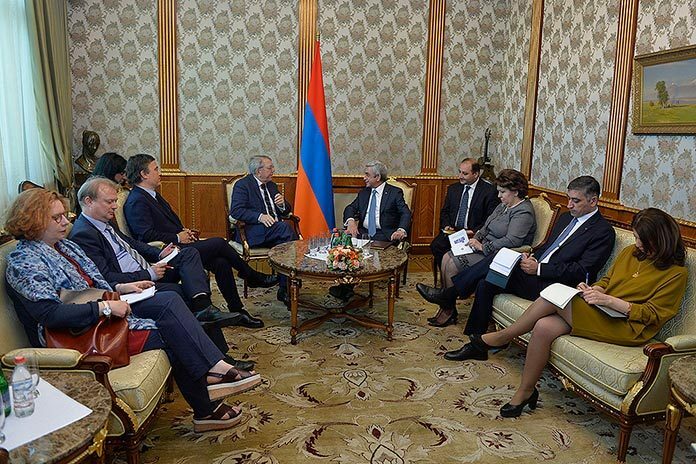 President Sargsyan expressed confidence that Armenia will properly implement the Council of Europe-Armenia 2015-2018 Action Plan, which is officially to be launched on May 21 of this year. During their meeting with Sargsyan the co-rapporteurs also spoke about tensions that have recently increased in the Karabakh conflict zone due to ceasefire violations. They have also touched upon the possibilities of resuming the negotiation process on the settlement of the conflict. Earlier Alan Meale and Giuseppe Galati met with Prime Minister Hovik Abrahamyan, who, referring to the four-day war in April, said that Azerbaijan had carried out large-scale aggression against the civilian population, including children and elderly people of Karabakh. He added that the aggression had been accompanied by gross violations of international humanitarian law and human rights, and it should become a subject of discussion in the international community, should be condemned and properly assessed. “The position of the Armenian side is clear: the Nagorno Karabakh conflict must be settled within the OSCE Minsk Group, by means of peaceful negotiations,” said Abrahamyan. Expressing sympathy for the victims, Alan Meale and Giuseppe Galati said that they support the efforts of the OSCE Minsk Group on the peaceful settlement of the Karabakh conflict. The PACE officials observed that a spirit of unanimity and solidarity on Karabakh was visible among Armenian political forces. “We are going to submit a report to the Council of Europe Commissioner for Human Rights on the fact of murdering and beheading of a conscript, and then publicizing it,” said the co-rapporteurs. During the meeting with Justice Minister Arpine Hovhannisyan, the PACE officials were introduced to the extensive process of legislative regulations which followed the Constitutional referendum in Armenia. The Ministry of Justice carries the main responsibility in that process. The sides also referred to the draft Electoral Code and the anti-corruption actions initiated by the Ministry of Justice. The co-rapporteurs were also told that “numerous” proposals, submitted by opposition political parties and civil society, had been included in the draft Electoral Code.